The 27th January marks the anniversary of the liberation of Auschwitz-Birkenau, the largest Nazi death camp. On this day, Holocaust Memorial Day, we commemorate the victims of the Holocaust and remember genocides that have occurred notwithstanding the world’s promise of ‘Never Again’ – Cambodia, Rwanda, Bosnia, Darfur. Britain’s young people can stand up to hatred and help create a safer, stronger society – inspired by the lessons of the Srebrenica genocide as the nation marks the 21st anniversary of the atrocity. 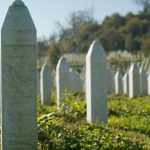 This year is the 21st anniversary of the Srebrenica genocide and the United Kingdom’s Srebrenica Memorial Week runs from Sunday 10 July to Sunday 17 July 2016. Our theme to mark this milestone anniversary is ’21: Coming of age – time to act’.